(CNNMoney) -- Some of the most valuable real estate in cities is hidden beneath parked cars. For managers of urban resources, this turf is a blind spot. There's no real-time data about how it gets used, and you can't manage what you can't measure. Experts believe that some 30% of urban traffic comes from cars hunting for parking spaces. 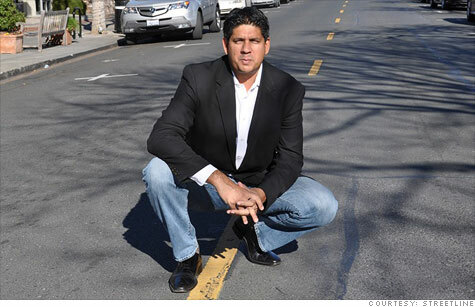 Enter Streetline, a 30-employee company in San Francisco that creates and installs wireless sensor networks to monitor parking spaces. Each sensor uses a magnetometer to detect the presence of large metal objects nearby. "If the sensor is within two or three feet of the car, it will register a huge increase in metal," explains Zia Yusuf, 45, the company's chief executive. "When the metal content suddenly drops, we know a car left." The sensors communicate wirelessly, signaling whether spots are occupied or vacant, gradually collecting data to reveal local parking patterns. That information allows cities to price their parking spaces according to their actual value, factoring in supply and demand as they would with any other piece of real estate. With that data, cities can both help ease congestion and boost their meter revenue. Streetline charges its clients a monthly usage fee of $25 to $30 per sensor. The fee covers installation, maintenance and management of the software that collects and distributes parking data. The company does not publicly disclose financial information, but Yusuf says that Streetline is now raising its second round of funding and expects to see its annual revenue rise by 75% for 2011. "I think this technology will transform urban transportation," says Donald Shoup, a professor of urban planning at UCLA's Luskin School of Public Affairs. He cautions, however, that city governments are rarely early adopters, and signing them up as clients typically involves many bureaucratic headaches. So far Streetline has set up networks in areas including parts of Los Angeles, Roosevelt Island in New York City, the parking lots at Fort Totten Metro station in Washington, D.C., and a garage at the conference center in Salt Lake City's Temple Square. The company has also released an iPhone application called Parker, which shows drivers how many parking spots are available on blocks within the sensor network. An Android version is in development. Streetline rolled out a pilot program in Hollywood in December, tracking about 800 parking spaces there. Bruce Gillman, a spokesman for Los Angeles' department of transportation, said the agency plans to add 200 more in the Studio City neighborhood. "The feedback we have gotten from those who are using the Parker app is really positive," says Gillman, who uses the Parker app himself. "We are looking to see how adaptable it is as part of our ongoing efforts to reduce congestion." Streetline was launched in 2007 by a team of five entrepreneurs; in 2010, the company was named IBM's Global Entrepreneur of the Year. IBM (IBM, Fortune 500) executives were impressed by the potential of real-time parking data to help cities to solve major problems, says Claudia Fan Munce, the managing director of IBM's venture capital group in Silicon Valley. Late last month, the University of Maryland's College Park campus announced it would use Streetline's technology to give electric car drivers real-time information about the availability of charging stations. Sensors will also be used in 50 metered spots near the center of the campus, in spaces for handicapped parking and in areas reserved for emergency vehicles. But where there's opportunity, there's competition. Earlier this year, Streetline lost a parking project on its San Francisco home turf to a rival: StreetSmart Technology, a company based in Georgia. Yusuf hasn't let that faze him. He sees in Streetline's products a "huge opportunity for cities to manage parking much more efficiently." More cities are coming around to his way of thinking. During its first four years of business, Streetline closed only two deals. In the past six months, it closed six of them.